What are the names of the patches in each bank? Which note names should be used for each patch? What are the names of the MIDI Controllers for this instrument? Which RPN and NRPNs are available on the instrument? Which Bank Select method does the instrument use? To collect this information, you need the MIDI documentation for your instrument. Create a new instrument in the Instrument tree. Create any new name lists in the Names tree that are required for the instrument. Drag name lists and possibly a bank select method to the new instrument from the Names tree. Close the Define Instruments and Names dialog box. For detailed instructions, see To create a new instrument. You define instruments in the Define Instruments and Names dialog box, shown in the following figure. Figure 1083. The Define Instruments and Names dialog box. You expand or collapse the folders and lists in each tree by clicking on the + or - key shown to the left of each item. You can also right-click on an item and choose Expand or Collapse from the menu, or double-click on an item to expand or collapse it. To define an instrument, you drag resources from the Names tree to the name of an instrument on the Instruments tree. Each resource is color-coded—you can only drag a Names list to an Instrument tree branch of the same color. For example, you can only drag a list from the Patch Names folder in the Names tree to a Patch Names for Banks folder in the Instruments tree. The instrument definitions organize all names (patches, notes, controllers, RPNs, and NRPNs) into lists. You may be able to define a new instrument using existing name lists. For example, two models of synthesizers made by a particular manufacturer may have identical patch name lists but use different NRPNs. In this case, you can use the same patch name lists for both instruments, but you would need to use a different NRPN list (or perhaps create a new NRPN list) for the second synth. If you want your changes to be remembered the next time you run Cakewalk, make sure the Save Changes For Next Session option in the Assign Instruments dialog box is checked before clicking OK. Otherwise, to make only temporary changes, be sure to remove the check from that option. In the Define Instruments and Names dialog box, right-click the word Instruments at the top of the Instrument tree, and choose Add Instrument from the pop-up menu. Type a name for the new instrument and press ENTER. The new instrument is provided with default settings for all of its characteristics. In the Define Instruments and Names dialog box, right-click an Instrument name in the Instrument tree and choose Edit from the pop-up menu. In the Define Instruments and Names dialog box, right-click an Instrument name in the Instrument tree and choose Delete from the menu. Confirm that you want to delete the instrument. Cakewalk saves the instrument definition in the Master.ins file. In the Define Instruments and Names dialog box, right-click an Instrument name in the Instrument tree and choose Export from the menu to display the Export Instrument Definition dialog box. If you don’t want to save the file in the folder that’s listed in the Save In field, navigate to the folder in which you do want to save the file. Cakewalk saves the file, with the filename extension .ins. Note: Exporting instrument definitions allows you to share them with other Cakewalk users. Users of MIDI librarian programs need the ability to update Cakewalk’s instrument definitions in real-time, without having to close and restart Cakewalk. 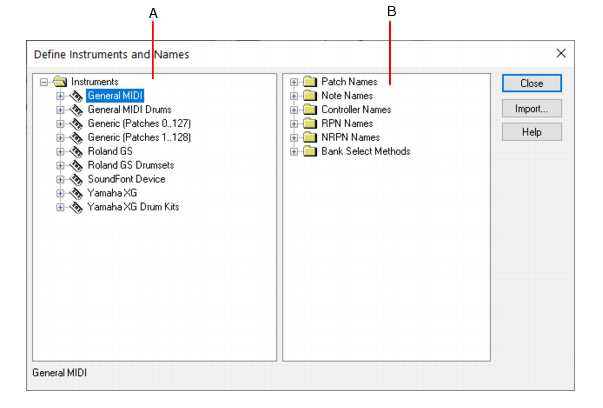 When the Reset (Panic) button is pressed, Cakewalk closes and reopens the instrument manager to reload settings from Master.ins and Instrmap.ini. Any changes made to patch names or other instrument definitions are reflected immediately.